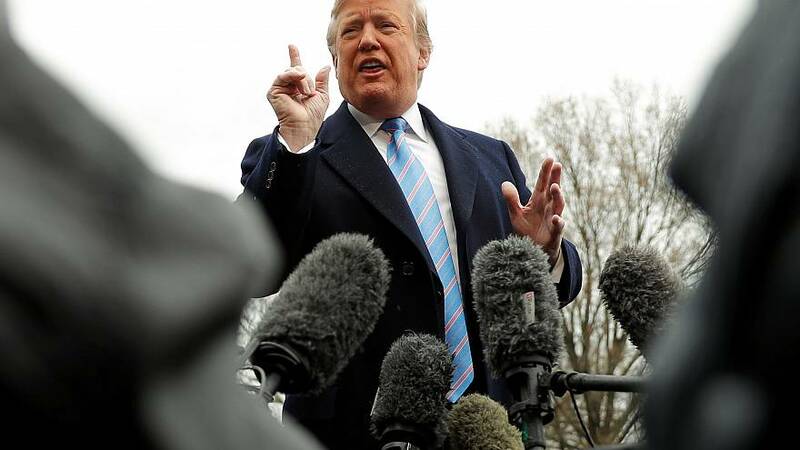 President Donald Trump said Friday that he would not attend the annual White House Correspondents' Association dinner later this month, confirming his plan to skip the event traditionally attended by sitting presidents for the third year in a row. Trump told reporters that the event was "negative" and "boring" as he was leaving the White House on his way to visit the southern border in California Friday morning. "We're going to hold a very positive rally," Trump said, instead of attending the annual event on April 27. "It'll be big," he promised. In response to the backlash from last year's dinner, the White House Correspondents' Association announced that they would break with the tradition of having a comedian host the event and instead invite historian Ron Chernow would deliver the keynote address. There was some speculation that the president might attend this year given that there would be no comedian to crack jokes at the administration's expense.